Eliminates the needs for an HTTP load balancer because the drivers are cluster aware and will load balance for you. Simplify the development of your application by using the same Data Access Objects for CQL and Elasticsearch requests. Get integrated security with Cassandra authentication and TLS encryption. Manage the Elasticsearch scrolling through the CQL paging. Add a dummy column es_query to your cassandra table. Add a dummy column es_options to your cassandra table if you need to specify some specific options like target index names. Then you can query the associated Elasticsearch index directly into a CQL SELECT request such as (document _type is the cassandra table name). If your target index does not have the same name as the underlying keyspace one, you can specify targeted indices names in es_options, that must be followed by ALLOW FILTERING. By default, when the Cassandra driver paging is enabled, the CQL query handler open a scroll cursor to retrieve large numbers of results (or even all results). The scroll context is automatically released when fetching the last page. The default scoll timeout is 60 seconds. If you only need the first N results, use the CQL LIMIT clause as shown below. When the resquested LIMIT is lower than the CQL page size (default is 5000, see CQL Paging), the CQL query handler does not open a scroll cursor, but just set the elasticsearch query size. If all partition key columns are set in the where clause, the Elasticsearch query will be directly sent to a node hosting the data (no fan out). Cassandra functions and User Defined Functions can be used in the CQL projection clause. Returned columns are named with aggregations names. CQL functions are not supported. CQL projection clause, limit and pagination are ignored. It also implies that aggregation results must fit into the available memory. When requesting multiple sibling aggregations, the tree result is flattened. In the following example, there are two top level aggregations named sales_per_month and sum_monthly_sales. In order to build elasticsearch queries, query builders and helpers from elastic can be used as shown bellow and use it in a CQL prepared statement. You can also retrieve the Elasticsearch results summary hits.total, hits.max_score, _shards.total, _shards.successful, _shards.skipped and _shards.failed from the result custom payload. When sum of _shards.successful, _shards.skipped and _shards.failed is lower than _shards.total, it means the search is not consistent because of missing nodes. In such cases, index state is red. Elassandra Unit helps you writing isolated JUnit tests in a Test Driven Development style with an embedded Elassandra instance. 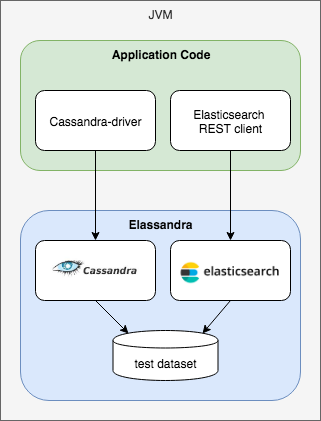 In order to execute Elasticsearch queries through CQL with Elassandra unit, set the system property cassandra.custom_query_handler_class to org.elassandra.index.ElasticQueryHandler. Moreover set the system property cassandra.ring_delay_ms to 0 to quickly start elassandra. Elasticsearch search request may invlove CQL requests to requested fields from the underlying Cassandra table. When searching through CQL, you can use Cassandra tracing capabilities to troubleshoot the Cassandra performance problems. You can then retreive tracing information stored into the system_traces keyspace for 24 hours as demonstrated below.